Today after work I transformed our hall entry table into a Derby themed tablescape. I used four of my mint julep cups given to me by my sweet Great Aunt Helen. Mint Juleps are a staple at the Derby. I placed them on a checked napkin under another gift from my Aunt Helen, a silver tray. I love the detail work on the edge of the tray. I surrounded the cups with roses. Next to the tray I placed this painting of a horse, which I painted when I was ten. He's a match to another horse. These were one of those paint by numbers sets. It took forever (well forever in 10 year old time) and I was sure I was going to be a famous painter upon completion. For some height and greenery I hung this boxwood wreath on a rod iron wreath hanger to the left of the julep cups. I think it turned our very Derby! 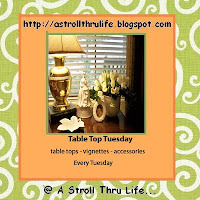 Today I'm joining three terrific hostesses for Table Top Tuesday, Three or More Tuesday and Ruby Tuesday. 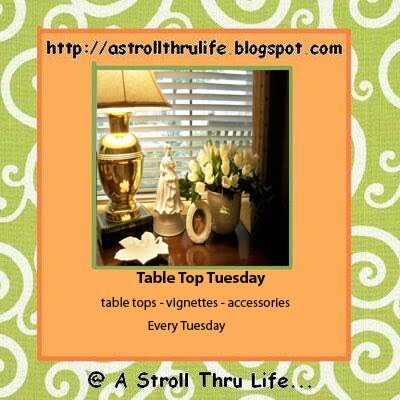 Please visit all three for more great Tuesday inspirations! How cute! I love tables that celebrate special events in our lives. I used to love those Paint by Numbers sets and its true, they made you feel like a budding artist! Your horse turned out terrific and what a sweet memory to put on your table. Your Derby tribute vignette is terrific! I really like the combination of items you've used especially including the mint julep cups. The Ky Derby is coming up once again, isn't it? The first weekend in May? Oh look! Is that an original Jennifer? I think it is worth millions at auction. Quick...see if she signed it. It was done during her "horsey" period. I don't think I ever finished a paint by number. Short attention span. Stop and visit any time! "Forever in 10 year time..." So true. I enjoyed your Derby preparations. 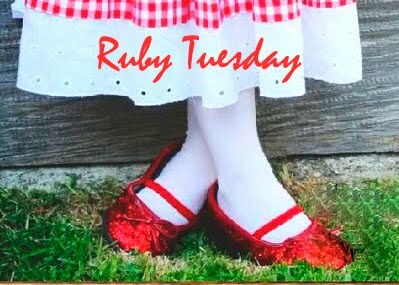 Happy Ruby Tuesday. Happy Derby Day when the time comes).